Saul Alvarez and Shane Mosley were face to face during the final presser that took place today at the Hollywood Theatre in the MGM Grand where many media outlets attend. Alvarez and Mosley trainers spoke about the preparations their boxers had during the high camp in the Big Bear Mountains. Chepo Reynoso, manager of the Mexican idol, said that “Mosley will be the door that will lead “Canelo” to major leagues of boxing. We’re ready to fight and win, thank you!” he said. Then the three time world champion, Mosley took the micro and said: “It’s gonna be a great fight. I’m in great shape. I’m ready to rock and roll. I sound like a broken record. I’m ready…I’m REALLY ready! This is a golden chance for me, I’m very happy. 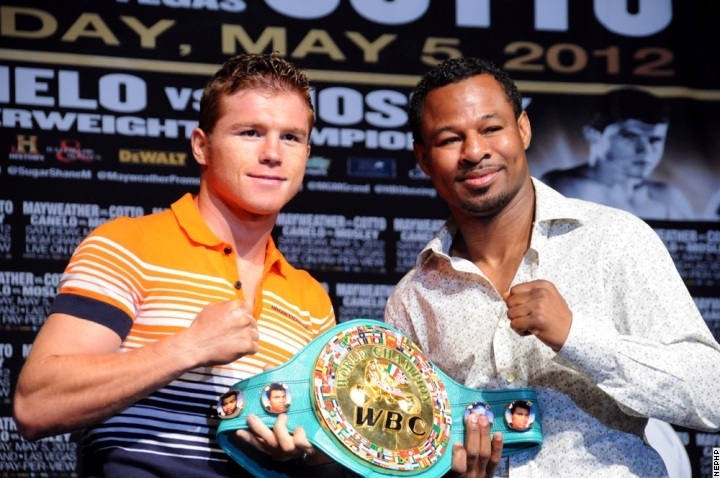 “Canelo” on the other corner was brief and said: I prepared very well for this fight with Shane Mosley. What can I say about Shane Mosley? Nothing but nice things….but, I’m going to win. It’ll be a great win for all Mexico and our team. Oscar De la Hoya said that this bout could steal the show from the bout feature by Floyd Mayweather and Miguel Cotto this Saturday. The president of the WBC, Jose Sulaiman said: “it will be a very tough fight for Alvarez, he will face a legend like Mosley, who despite he’s not in the best years of his career, he stills being a great and dangerous rival”. The ring officials for this bout will be Jay Nady as the referee and the three judges, all of them with more than ten years of experiences are Cinthya J. Ross (Nevada), Glenn Trowbridge (Nevada) and Jesse Reyes (Texas).